I pray all are having a wonderfully blessed day. On this day, I am contemplating the concept of abundance and the counter concepts of lack of scarcity. I am in a place of contemplating what keeps some of us in a place of lack and scarcity in our lives. And I’m speaking specifically about financial scarcity. Whether it’s perceived or real there is a reason why some of us struggle in our finances, struggle with the perception of never having enough. There is a reason why some of us live month to month and remain in a cycle of living paycheck to paycheck. So I’m reflecting, if this is an abundant universe why does there seem to be such a perceived imbalance? Why is that some struggle with managing money and others seem to do it with seamless ease? At the root, what are our issues with money? Because of the season I am currently in, I’m reflecting on what has kept me personally in a perceived state of lack and scarcity when it comes to my finances. On a more global level, my journey towards financial peace has been multi-layered. God has revealed a great deal about my financial journey and provided Divine revelations behind everything that has occurred not only in my financial life but my whole life. However, I still find myself wondering what keeps me in this vicious cycle of seemingly never having enough. What keeps the opportunities that God has Divinely designed for me from coming to fruition? Unfortunately, this is not a new battle. This battle has warred for a substantive period over my lifetime. No matter how much I had, no matter how much I made it was never enough. At a time when I consistently made over $100K a year, it still wasn’t enough. And at a time when I currently have limited income and receive food stamp benefits each month, there still isn’t enough. There is something truly wrong with this picture. I asked God today “What’s up with this God? (that’s how we talk because He told me He’s my friend and to be real and transparent at all times :)). “What is it that I am doing or not doing that is inhibiting my financial blessings and progression forward?” As I waited in reflection, He placed in my spirit one of the answers. His response was that my current struggles are rooted in fear. Not exactly what I wanted to hear, as I’ve heard this before. But, what I needed to hear. God reaffirmed that when we live in fear that we will not have enough…we will not have enough. We are basically saying that we do not trust Him to “provide all of our needs according to His riches in glory”. When we fear that we will not be able to pay the light bill this month or the car payment next month we are saying to God that we do not believe “that all things all possible for those that love the Lord”. 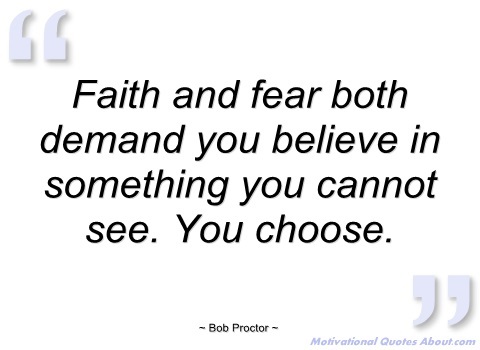 When we live in a state of fear, we virtually invite lack and scarcity in through our thoughts, beliefs and actions. Fear is the direct opposite of faith. And as His word says “For God has not given us a spirit of fear and timidity, but of power, love, and self-discipline”. When we live and act in fear it’s almost as if we place God on hold. And He waits patiently for us to come out of this place and put our faith and trust back in Him. As soon as that shift occurs, it’s as if God again opens the floodgates of heaven and all begins to flow seamlessly again. The other major epiphany the Lord provided was that I still have yet to truly value myself and embrace my own self worth. Ok, that’s not exactly the answer I wanted to hear either, but as always…He is right. My struggles in my finances have always had to do with my own self worth. Feeling that I was not worthy of receiving that which I was blessed to receive. I know that I have yet to fully offer myself the grace and unconditional love that God asked of me. I have not yet put into place the daily disciplines and the blueprint He Divinely designed for me that keeps me closely connected to Him at all times. So, I must again focus on stating and believing daily and knowing deeply within my soul that I am truly worthy of all that God has for me. These revelations do not necessarily mean that those that have financial abundance value themselves more than others. In fact, oftentimes it’s the direct opposite. The reality is that many who have an exuberant wealth greatly struggle, just in different ways. From the outside looking in it seems as if all is seamless and they have few problems – that is far from the truth. They too have struggles. They too struggle with fear. However, their fear is different. They often fear losing all that they’ve acquired which keeps them in the vicious cycle of working to exhaustion to ensure that they can maintain their acquired lifestyle. So the battle is real, no matter socio-economic level. The Lord revealed to me some time ago that He oftentimes allows us to acquire wealth and material belongings so that He can provide a deeper Divine revelation. A revelation that even after acquiring financial wealth, material belongings, shopping, traveling and vacationing there will still be something missing. He allows it so that we can see for ourselves the depth of un-fulfillment within. God allows all of this to occur so that we can see that even after acquiring money and material possessions we will still be unable to fill the hole in our souls – a hole that is Divinely designed just for Him. As His word says “No one can serve two masters. Either you will hate the one and love the other, or you will be devoted to the one and despise the other. You cannot serve both God and money”. At the impetus of my Divine Storm, I prayed to understand the root cause of my financial challenges. I’m learning in this journey that you should be careful what you pray for. When you ask God, He will definitely bring it to fruition – and most certainly when it involves one of His core teachings. In no way do I regret that prayer because in responding, God has blessed me and healed in ways I could have never imagined. However I also know that until we truly learn and embrace the lessons He seeks to provide, we remain within a vicious cycle we fight desperately to get out of. Ultimately this issue for me and many others is not about money, it’s much deeper than that. It’s the revelation and recognition that we must put our complete and total faith and trust in God for all things. We must do those things that sustain our spirits and keep us closely connected to Him. We must realize that life is not happening to us, it is happening for us and take every opportunity to embrace the lessons and guidance He provides. So, on this day I’m calling “Uncle” :). While it took me a long time to get it, I get it God. I truly get it!! I’M READY!!!! (At least I truly pray I am). I’m truly ready to bring an end to this cycle of perceived lack and scarcity. I am ready to fully open myself to up to not only the financial abundance that God has promised, but to all of His promises. I’m ready to fully open myself up to God’s will in every aspect of my life.